No food-themed explosion would be complete without a celebration of wine and wine culture. 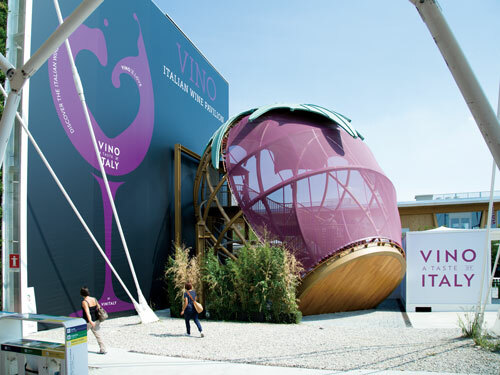 Curated by the Italian ministry of agriculture and the Veronafiere wine festival, the three-floor pavilion encouraged visitors to explore the store of wine under the title ‘Vino – A Taste of Italy’. Together with a Wine Library, where more than 1,400 varieties of Italian wine distillates could be samples, a huge variety of communication tools were employed to provide immersive multi-sensory experience. The centrepiece media exhibit was a stunning holographic display created with a network of 14 Panasonic 1-Chip DLP™ PT-DZ680 projectors to narrate the history of wine production. The PT-DZ680 proved ideal in this role with its RGB Booster technology, which modulates lamp output power to maximise the colour reproduction of each image without sacrificing brightness. Free 360º cabinet rotation and powered lens shift made installation for holographic projection quick and simple.